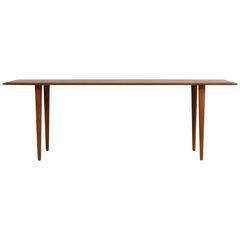 Beautiful 1960s Danish modern coffee table, made in Denmark, beautiful vintage table, fantastic condition, early edition, teak wood, tripod table. 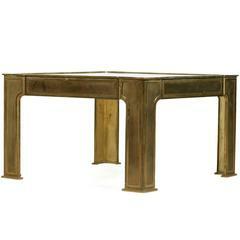 Beautiful solid brass table, 1960s Germany or Austria. Clear glass, overall in a very good vintage condition, heavy weight. 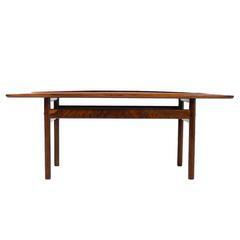 Beautiful Danish modern 1960s coffee table by Grete Jalk for Poul Jeppesen, Denmark. Rare model and early production, beautiful condition. Very good condition, matching easy chairs available. Arne Wahl Iversen side table/coffee. Made of solid teak. 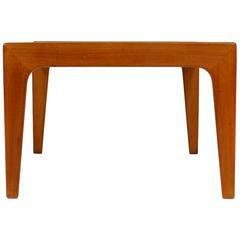 Danish modern coffee table in teak with splayed legs and single shelf, 1960s. Measures: Height 54cm Length 150cm Depth 55cm. Mid-Century Modern white wash finish bamboo sheaf base coffee table by McGuire. Teak coffee table with ceramic hand-painted tiles. The coffee table has been restored and has only small signs of age and use.